Tagline: "There's Something Strange Going on Here." Head Count is an upcoming indie horror film, from first time director Elle Callahan. The film is set near Joshua Tree National Park. Here, an entity needs victims to fulfill a deadly ritual. When five friends turn up, they are targeted by the creature and a deadly game of cat-and-mouse begins. In 2018, this film had its World Premiere at the Los Angeles Film Festival. Here, actress Ashleigh Morghan (Paper Shadows) won a Special Mention, in the acting category. The film also stars: Bevin Brue (The Vixens), Isaac W. Jay, Billy Meade and Hunter Peterson. 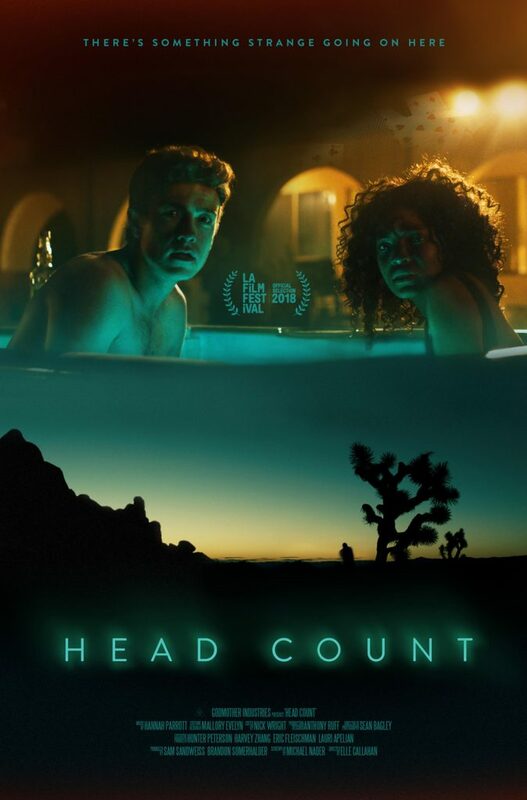 Now, Head Count is slated for a Summer release. Story details are a bit sparse. However, director Callahan has mentioned that this film is a creature feature: "the story is a monster movie at the end of the day, and I really wanted to build a creature that had its own lore (Daily Dead)." Yet, this creature is not shown in the official trailer, which was released late last year; only the sound of flitting wings can be heard. Callahan calls the film's stalker a hisji: "which is the monster in Head Count...a culmination of a skin walker, a wendigo, and witchcraft." Horror fans can preview this thing as the film prepares for a Digital run, this June. Samuel Goldwyn Films will handle the distribution of the film, in the USA. To show initially on Digital, Head Count will show this June 14th. Fans of horror can find the latest release details here. Release date: June 14, 2019 (US, Digital). Writers: Elle Callahan and Michael Nader. Cast: Isaac W. Jay, Ashleigh Morghan, Bevin Bru, Billy Meade, Hunter Peterson, Chelcie May, Tory Freeth, Michael Herman, Amaka Obiechie, Sam Marra and Cooper Rowe.